My C.A.S.E. Studies: Do you smell carrots? Small update - I got voted out of the MFT Idol contest, but I wanted to thank everyone for their votes!! I'm actually a little relieved - the stress of trying to compete with those talented ladies was really tough to deal with, so now I can relax and just play! For today's card, I decided to try this week's TCP Tuesday sketch challenge. 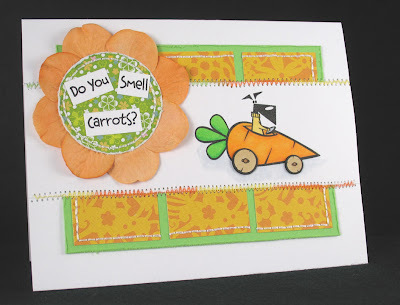 I used an image from the Spring Fling set (isn't that carrot car too cute??) and a sentiment from Beans & Bunnies & Peeps, Oh My!. Although it didn't come out exactly how I wanted it, I still love it, especially the flower! I hand stitched the white parts and machine stitched the zig zags (I just happened to have a spool of variegated thread that's yellow, orange and green!). I popped up the wheels and colored the image with Copics. For the flower, since I didn't have one big enough, I took 2 Prima hydrangeas, cut the petals apart, and glued them behind the circle. I love the look of it and will definitely be trying it again in the future. TFL! Other materials used: green cardstock - Stampin' Up! ; white cardstock - Georgia Pacific; patterned paper - K&Co. Berry Sweet pad. Very cute! Great stitching & layout. OMG...Fabulous card, Maureen! I'm just getting back from a weekend away and checking the cards. So glad you've played along with us...super job! I Wanna Be The MFT Idol!